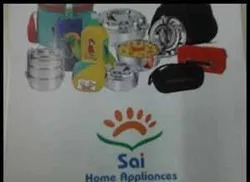 Established in the year 1990, we, “Sai Home Appliances”, are widely recognized as one of prominent manufacturers and exporters of a wide array of Lunch Boxes, Kitchenware and Water Bottles. Our offered kitchenware and lunch boxes are manufactured by making use of the high quality steel and other raw material so as to ensure their synchronization with the established quality standards of the industry. After the completion of the production process, we make these kitchenware, lunch boxes and bottles undergo a quality check so as to ensure their outstanding features such as strong construction, resistance against rust, durability, smooth finish, attractive design, innovative patrons, leak-proof and easy to handle. 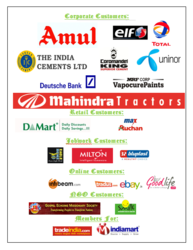 Our main customers are Amul, Total Oil, D-mart etc. Backed by the support of our spacious infrastructure, we are able to cater to the bulk requirements of patrons. In this infrastructure, we have installed all the required amenities and appointed experience professionals. These professionals are well-versed with the usage of modern machines and equipment, owing to which we are able to manufacture these kitchenware, lunch boxes and bottles and render pressing job services as per the details given by patrons. We have our clients from all across Middle East, East Asia & Indian Subcontinent. With the constant support of our mentor, 'Mr. Hastimal Malvi', we have been able to stand tall on the expectations of patrons and establish ourselves as an trusted organization in this domain. He is a man of dignity and known for his business skill & ethical business policies. Our Contract Manufacturing includes OEM Service Offered, Design Service Offered & Buyer Label Offered. Supported by a team of dedicated and skilled professionals, we have been able to establish our organization as one of the trusted manufacturers and exporters of high grade Lunch Boxes, Kitchenware and Water Bottles. Our professionals have profound knowledge of this domain and are well-aware of the usage of the modern machinery. In addition to this, our professionals always come with innovative ideas to make our kitchenware, lunch boxes and bottles look more attractive. Our professionals also gauge the required specifications of patrons and provide them with these kitchenware, lunch boxes and bottles, accordingly. We strive to maintain the peerless standards of our array of Lunch Boxes, Kitchenware and Water Bottles so as to provide patrons with quality assured products. To manufacture the offered kitchenware, kitchenware, lunch boxes and bottles, we source the steel and other base material from the authentic vendors of the industry. Further, we manufacture these kitchenware, lunch boxes and bottles under the supervision of professionals who stringently adhere to defined industry norms of the industry. Post production, we make these kitchenware, lunch boxes and bottles pass a quality check so as to ensure their durability, resistance against rust and fine finish. We strive to stand tall on the expectations of patrons by providing them with Lunch Boxes, Kitchenware and Water Bottles as per their given details. Further, with an aim to ensure that offered kitchenware, lunch boxes and bottles serve patrons long, we manufacture these utilizing quality-assured raw material. Post production, we check these kitchenware, lunch boxes and bottles so as to ensure that our patrons receive a flawless array. Apart from this, we ensure to deliver these kitchenware, lunch boxes and bottles at customers'' specified location within set time frame. Our organization holds expertise in manufacturing, supplying and exporting quality assured range of Lunch Boxes, Kitchenware and Water Bottles. We manufacture these kitchenware, lunch boxes and bottles with the assistance of professionals by using best grade steel and other base material. Further, while manufacturing these kitchenware, lunch boxes and bottles, we keep in mind the established quality standards.